This week I talk about Diablo III and Starcraft 2, give details about my upcoming talks at I-CON 25, review an IGF Competition Finalist, answer a ton of show mail, and so much more. Enjoy! New DS hitting Japan this March. The US gets Brainy this spring. Xbox 360 loses the remote. Stargate enters the MMO universe. Blizzard stirring up hell recruiting for the Diablo team. S.T.A.L.K.E.R. and Supreme Commander delayed until 2007. PCs to be Condemned this spring. 00:29:13 SporeTalk: I answer lots of questions about Spore. 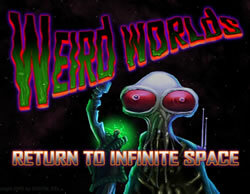 00:38:19 Game Review: Weird Worlds: Return to Infinite Space for the PC. 00:49:42 RetroReview: Aliens vs. Predator 2 for the PC. 00:56:47 “Name That Game!” contest winner from last week, a new clip, and a very cool prize! 01:02:28 Show Mail: I answer your audio and email questions. 01:46:00 Final Thoughts: Results from last week’s Final Thoughts contest, why Starcraft 2 isn’t coming any time soon, and more. Download the show (113 minutes): Gaming Steve Episode 37 (MP3).